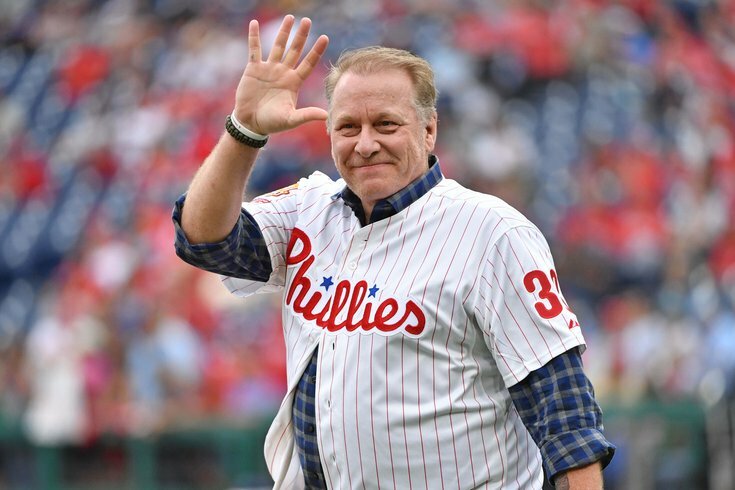 Former Philadelphia Phillies pitcher Curt Schilling acknowledges the crowd during pregame ceremony celebrating the 25th anniversary of the 1993 National League East Champions. Mitch Williams doesn't forgive easily, apparently. During the 1993 World Series, when Williams was on the mound, Phillies teammate and starting pitcher Curt Schilling put a towel over his head in the dugout because, well, he just couldn't bear to watch. Unfortunately, we all know how that series ended, and apparently Williams hasn't forgot about Schilling's sign of disrespect — he admitted on The Dan Patrick Show a few years back that he still hasn't forgiven Schilling for it. Now, after Schilling has again been denied entry into the Baseball Hall of Fame, Williams took to Twitter to show his support — his support of the baseball writers who voted against Schilling, that is. He was a great postseason pitcher,when they add a wing to the Hof for that, he’s a 1st ballot guy. 216 wins in 22 yrs? That’s a Hof-er? Schilling, who has failed to receive the 75 percent of votes necessary for enshrinement since first becoming eligible in 2013, has been getting closer to making it to Cooperstown each passing year. This year, he received 60.9 percent of votes, his highest total so far and the highest total of any player not to make the Hall of Fame in 2019. The four players voted in this year were Roy Halladay, Mariano Rivera, Edgar Martinez, Mike Mussina. As for Schilling, he'll have to wait another year.